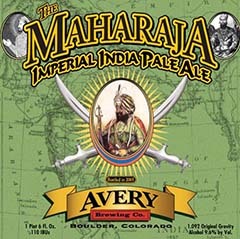 The Maharaja pours a medium amber color with a very active, fizzy off-white head with fantastic retention. Settles a light golden honey color. Fair lacing, but the fizzy head doesn&apos;t grip very well as it subsides fairly quickly. Aroma is dominated by spruce hops, reminding us of Christmas time as the needles fall off the tree, accompanied by citrus notes provided by a decent hit of grapefruit. Initial taste is heavy bitter up front, with an almost smoky presence reminiscent of an ashtray aroma, like tobacco, giving way to a light bitter finish with a long duration of sweet hops. Light to medium bodied, it has an oily texture with soft carbonation thats just enough to carry the taste from front to back. Unbelievable aroma keeps us coming back for more. I'm actually angry at Ryan that he poured himself a wine glass full of this and left me with a 4 oz sampler. Reviewed on May 18th, 2007.